Ah, the early 1990s: Now this, dear readers, is a truly crappy card. Look at this thing. It hails from an era of trashy cards seemingly made in some jerk's garage. Want an example of another one? Here ya go. But they don't get much worse than this. 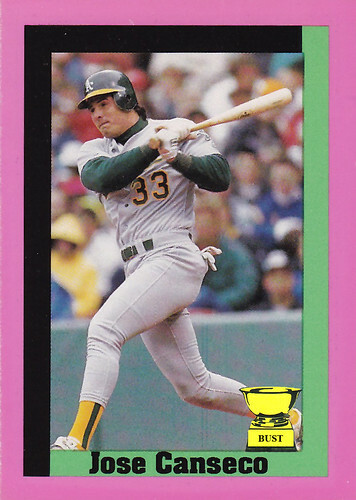 Canseco, in all his glory, is wearing a turtleneck and Spandex shorts beneath his baseball pants. Of course, the real star is the hot-pink border, which, according to court records, caused blindness in no fewer than 17 children. The green-black secondary border is a nice touch, too. It nearly matches the color scheme of the A's uniforms. That, of course, would have been too much to ask for. OK, so, random shot of Canseco? Check. Only-in-the-1990s border color scheme? Check. Now only if the card came from a company with an awesome name. Wait ... a ... second. Jose Limited? The card company is called Jose Limited? Well, dear readers, this just qualified as one of the worst cards of the decade.